For patients presenting with acute brain injury (such as traumatic brain injury, subarachnoid haemorrhage and stroke), the diagnosis and identification of intracerebral lesions and evaluation of the severity, prognosis and treatment efficacy can be challenging. The complexity and heterogeneity of lesions after brain injury are most probably responsible for this difficulty. Patients with apparently comparable brain lesions on imaging may have different neurological outcomes or responses to therapy. In recent years, plasmatic and cerebrospinal fluid biomarkers have emerged as possible tools to distinguish between the different pathophysiological processes. This review aims to summarise the plasmatic and cerebrospinal fluid biomarkers evaluated in subarachnoid haemorrhage, traumatic brain injury and stroke, and to clarify their related interests and limits for diagnosis and prognosis. For subarachnoid haemorrhage, particular interest has been focused on the biomarkers used to predict vasospasm and cerebral ischaemia. The efficacy of biomarkers in predicting the severity and outcome of traumatic brain injury has been stressed. The very early diagnostic performance of biomarkers and their ability to discriminate ischaemic from haemorrhagic stroke were studied. Despite significant advances in understanding the pathophysiology of brain injuries, there has been little change in terms of therapeutic or pharmacological treatment in recent years. The complexity and heterogeneity of lesions after brain injury are most probably responsible, at least in part, for the lack of positive results in clinical trials. Furthermore, patients with apparently comparable brain lesions on imaging may have different neurological outcomes or responses to therapy. The use of biomarkers in the setting of brain injury may be of interest not only for diagnosis and identification of intracranial lesions but also for the evaluation of the severity, prognosis and treatment efficacy. In addition, patient stratification, based on biomarkers, may be useful in clinical trials for selecting a homogeneous population and decreasing inclusion disparity. Brain biomarker detection in the cerebrospinal fluid (CSF) and in the blood has been described. Due to the separation of the brain from the blood by the blood–brain barrier (BBB), proteins produced within the brain are present only in small quantities in the blood if the BBB is intact. The BBB status (open or closed) therefore has a strong influence on the amount of those types of proteins in the blood and must be taken into consideration for the interpretation of brain injury blood biomarkers. The aim of this review is to summarise plasmatic and CSF biomarkers evaluated in subarachnoid haemorrhage (SAH), traumatic brain injury (TBI) and stroke, and to clarify their interest and limits for diagnosis and prognosis. Of note, the present review will not describe the neurological prognostic factors after cardiopulmonary resuscitation in patients with cardiac arrest. Serum levels of proteins neuron-specific enolase (NSE) and S100β are considered promising candidates for neurological predictors, and a review on the clinical usefulness of these markers has been published previously . Several biomarkers have been studied in terms of the short-term or long-term neurological prognostic factors and correlation with initial severity of patients after aneurysmal SAH [2–13]. Table 1 summarises different biomarkers and their correlation with initial neurological patient severity and prognosis. +, correlation described; −, lack of correlation; plasma/CSF, dosing site. ANP, atrial natriuretic peptide; ApoE, apolipoprotein E; BNP, brain natriuretic peptide; cTnI, cardiac troponin I; CRP, C-reactive protein; CSF, cerebrospinal fluid; ET-1, endothelin-1; Fisher, Fisher classification; GCS, Glasgow Coma Scale; GOS, Glasgow Outcome Scale; HH, Hunt and Hunter classification; ICAM-1, intercellular adhesion molecule-1; IL, interleukin; MMP-9, matrix metalloproteinase-9; NF, neurofilament; S100β, S100β protein; TNF, tumour necrosis factor; VCAM-1, vascular cell adhesion molecule-1; VEGF, vascular endothelial growth factor; vWF, von Willebrand factor; WFNS, World Federation of Neurosurgeons classification. Cerebral vasospasm and its related cerebral ischaemia remain the primary cause of mortality and neurological deficit after SAH and the most powerful predictors of long-term outcome [14, 15]. Physiological and morphological changes observed during cerebral vasospasm occur in two phases: a contraction of the arterial wall in the first 72 hours after onset of SAH, followed by smooth muscle cell proliferation in the intima of the main cerebral arteries. Indeed, sustained arterial contraction causes an increase in the shear stress of endothelial cells, from day 3 to day 14 after SAH, with an increase in endothelial permeability, expression of intercellular adhesion molecules with intimal infiltration of leukocytes, platelet adhesion to the internal elastic lamina, migration of smooth muscle cells and myointimal proliferation [16, 17]. Plasma and CSF biomarkers have been studied in the context of SAH, in relation to vasospasm and other factors such as systemic inflammation, microcirculatory disorders or microembolic release [18, 19]. A recent review classified CSF biomarkers for cerebral vasospasm according to reports in the literature as markers with auspicious value, candidate markers with insufficient evidence and noncandidate markers with no reference to cerebral vasospasm . An inflammatory response similar to that observed during coronary spasm appears to affect the cerebral circulation of patients with SAH. Proinflammatory cytokines – that is, IL-1β, IL-6 and tumour necrosis factor alpha – have been detected in the CSF of patients with SAH, with a peak between day 5 and day 9 followed by a gradual decrease . Peak concentrations of cytokines have been found to be increased up to 10,000-fold, in the range detected in bacterial meningitis . The concentrations of IL-1β and IL-6 are lower in the plasma than in the CSF, suggesting a cerebral origin of these mediators with a release mechanism. The triggers for this marked inflammatory response in the subarachnoid space of patients with SAH are still unknown. One hypothesis is a complement activation method via osmotically induced disruption of erythrocytes [22, 23]. A study of 35 patients with SAH revealed parallel changes in the velocities of the middle cerebral artery using transcranial Doppler and concentrations of IL-1β, IL-6 and tumour necrosis factor alpha in the CSF . Another study of 64 SAH patients confirmed the increase in CSF IL-6 (peak at day 4 to day 5) before the onset of clinical signs of vasospasm (peak at day 6 to day 7), with a threshold of 2,000 pg/ml at day 4 for the prediction of the development of symptomatic vasospasm (sensitivity = 89% and specificity = 78%) . Another recent study in 38 SAH patients reported higher concentrations of IL-6 in the CSF, brain extracellular fluid and plasma of symptomatic patients than in those of asymptomatic patients with vasospasm . Atrial natriuretic peptide and brain natriuretic peptide (BNP) are produced in the heart in response to neural and humoral stimuli and fluid overload . BNP is therefore not brain specific, but is also produced in brain tissue, especially in the hypothalamus. Two possible mechanisms for increased BNP production in the hypothalamus have been advanced: release secondary to humoral or paracrine signals, and a response to hypoxia due to vasospasm. Some evidence suggests that cerebral ischaemia after SAH is not only caused by large vessel spasm . Many hypotheses to explain this phenomenon have been proposed, including systemic infarction, microcirculatory spasm, and the release of microemboli [18, 19]. BNP may be a marker of a general process of microcirculatory dysfunction characterised by systemic inflammation and local thrombosis, as described in sepsis or haemorrhagic shock . In addition, a recent study links BNP release to proinflammatory cytokines . Berendes and colleagues  and Tomida and colleagues  reported an association between plasma BNP concentration and the development of delayed ischaemic neurological deficit (DIND). Sviri and colleagues  studied 38 patients with SAH and observed an increase in plasma BNP between day 1 and day 3 (69.6 ± 92.4 pg/ml) compared with control patients (5.8 ± 1.9 pg/ml). Patients not presenting with DIND have displayed a progressive decrease from day 3 in plasma BNP concentration. On the contrary, patients with DIND have displayed a gradual increase in plasma BNP concentration between day 3 and day 12 post-SAH . A recent study of 119 patients revealed a significant association between a BNP level >276 pg/ml in the plasma and the onset of cerebral ischaemia . Of note, BNP is biologically active and may increase the risk of cerebral ischaemia by its direct effects on the kidneys and systemic vessels, including natriuresis, vasodilatation and hypovolaemia. During cerebral vasospasm, sustained arterial contraction is at the origin of increases in the shear stress of endothelial cells and is associated with modifications of endothelial permeability, expression of adhesion molecules and myointimal proliferation [16, 17]. Vascular endothelial growth factor (VEGF) can initiate these changes because its concentration is increased in the intima after endothelial cell damage [33, 34]. Matrix metalloproteinase-9 (MMP-9) alone can stimulate the activity of VEGF by increasing the availability of VEGF in the media of vessels . Moreover, MMP-9 expression is increased in smooth muscle cells after alterations of endothelial cells, contributing to the initiation of myointimal proliferation . von Willebrand factor is considered a plasma marker of endothelial cell injury. McGirt and colleagues have demonstrated an increase in plasma concentrations of VEGF, MMP-9 and von Willebrand factor before the diagnosis of vasospasm by both transcranial Doppler and cerebral angiography in 38 patients with SAH . Peak concentrations were observed for von Willebrand factor, MMP-9 and VEGF at day 5, day 3 and day 2, respectively. Elevated plasma von Willebrand factor levels >5,500 ng/ml, MMP-9 levels >700 ng/ml and VEGF levels >0.12 ng/ml each independently increased the odds of vasospasm (17-fold, 25-fold and 21-fold, respectively). However, the plasma concentrations of these markers were not different between clinically symptomatic and asymptomatic patients with vasospasm. Recently, Chou and colleagues reported the lack of a correlation between CSF or plasmatic MMP-9 and vasospasm in 55 patients with SAH . Endothelin-1 has major vasoconstrictive effects in human arteries, including cerebral vessels . Furthermore, endothelin-1 has been found in neurons, glial cells, the choroid plexus and macrophages. The concentration of endothelin-1 in the CSF of SAH patients was significantly higher (2.5 ± 0.7 pg/ml) on the first day after onset of SAH than in the CSF of controls (normal values <0.85 pg/ml) . Endothelin-1 concentrations in CSF increase until the sixth day and then gradually decrease in patients without vasospasm. In addition, a significant increase in CSF endothelin-1 has been observed between day 4 and day 7 in symptomatic patients with vasospasm [38, 39]. One study found an endothelin-1 increase in the CSF before detection of angiographic vasospasm . Moreover, a significant correlation has been found between the concentration of endothelin-1 in the CSF and the extension of angiographic vasospasm . In plasma, no significant difference in endothelin-1 concentration has been demonstrated between patients with SAH and controls . Endothelin receptor antagonists have emerged as a promising therapeutic option. A recent Cochrane database review concluded that endothelin receptor antagonists appear to reduce DIND and angiographic vasospasm, but their benefit to clinical outcome remains unproven. Moreover, their associated adverse events were not negligible (for example, hypotension and pneumonia) . There is a large amount of evidence that inflammatory reactions may be involved in the pathogenesis of delayed ischaemic lesions. Several molecules could initiate the steps of the inflammatory cascade. These include intercellular adhesion molecule-1, an immunoglobulin-like molecule that is exposed to endothelial cells and induced by exposure to inflammatory cytokines, and vascular cell adhesion molecule-1 [43, 44]. Animal studies have demonstrated an upregulation of intercellular adhesion molecule-1 on endothelial and medial layers of cerebral arteries after SAH. Treatment with monoclonal antibodies against intercellular adhesion molecule-1 can reduce or even inhibit cerebral vasospasm in animals . An increase in the blood and CSF concentrations of intercellular adhesion molecule-1 and vascular cell adhesion molecule-1 in patients with SAH compared with a control group within the first 7 days has been described . There appears to be a correlation between cerebral blood flow velocities measured using transcranial Doppler and a secondary increase of intercellular adhesion molecule-1 and vascular cell adhesion molecule-1 in plasma and CSF . Neurofilaments are components of the axonal cytoskeleton and include heavy-chain neurofilaments (NF-H; 190 to 210 kDa), medium-chain neurofilaments (160 kDa), light-chain neurofilaments (68 kDa) and α-internexin (66 kDa) . In physiological conditions, neurofilaments are restricted to the intracellular compartment of the neuronal cells. Alteration of the axonal membrane integrity can result in the release of neurofilament proteins in the extracellular space and their spread into the CSF. The subunits of neurofilaments are therefore potentially useful for revealing axonal injury. Plasma NF-H concentrations in healthy individuals average 0.11 ng/ml, and CSF NF-H concentrations average 0.94 ng/ml . Petzold and colleagues reported a positive correlation between CSF concentrations of NF-H and prognosis (Glasgow Outcome Scale at 3 months) in SAH patients . Lewis and colleagues confirmed that high concentrations of NF-H in plasma and CSF were associated with a poor outcome at 6 months and that patients with vasospasm had increased levels of NF-H in CSF and plasma (16.7 ± 19.9 ng/ml and 0.44 ± 0.68 ng/ml) compared with patients without vasospasm (0.29 ± 0.44 ng/ml and 8.3 ± 15.3 ng/ml) . NF-H may thus be a useful marker of axonal injury in SAH. More recently, Zanier and colleagues  reported higher concentrations of light-chain neurofilaments in CSF obtained by external ventricular shunt in patients with early cerebral ischaemia defined by hypodense lesion on computed tomography (CT) within 72 hours of ruptured aneurysm (related to intracranial haemorrhage or complications of aneurysm treatment). However, there were no significant differences in external ventricular shunt light-chain neurofilaments concentrations between patients who developed clinical vasospasm and those with delayed cerebral ischaemia . α2-spectrin is a cytoskeletal protein. The products of its degradation by calpain and caspase-3 are potential markers of the severity of lesions in SAH. α2-spectrin is transformed into degradation products of 150 kDa (SBDP150) and 145 kDa (SBDP145) by calpain and is cleaved into a degradation product of 120 kDa (SBDP120) by caspase-3 . Calpain and caspase-3 are major effectors of cell death (respectively, necrotic and apoptotic). In a study of 20 patients with a high Fisher grade of SAH, Lewis and colleagues reported an increase in SBDP concentration in the CSF . SBDP150, SBDP145 and SBDP120 CSF concentrations were higher in patients with clinical vasospasm compared with patients who did not develop vasospasm. Moreover, symptomatic vasospasm was associated with an increase in the concentrations of SBDPs (SBDP145 and SBDP150) in the CSF 12 hours prior. The treatment of vasospasm induced a decrease in SBDPs to baseline levels in patients without ischaemia, but SBDP concentrations remained high in patients with cerebral ischaemia. S100β protein belongs to a multigenic family of low molecular weight (9 to 13 kDa) calcium-binding S100 proteins. S100β protein is mainly expressed in glial cells, particularly astrocytes . S100β protein is involved in intracellular signal transduction via the inhibition of protein phosphorylation, regulation of enzyme activities and affecting calcium homeostasis . In addition, S100β protein participates in the regulation of cell morphology by interacting with elements of the cytoplasmatic cytoskeleton. S100β protein is actively secreted into the CSF from astrocytes and is believed to have extracellular functions. The protein can be detected in both CSF (normal value 1 to 2 μg/l) and blood serum (normal value <0.15 μg/l), resulting from the elimination process after intracellular and extracellular actions. S100β protein’s biological half-life is 2 hours; the protein can be detected in both CSF and blood serum. Kay and colleagues report an increase (compared with a control population) of its concentration in CSF after SAH in patients with neurologic symptoms . A recent study of 55 patients with SAH shows that plasma and CSF concentrations of S100β can detect cerebral ischaemia and intracranial hypertension after SAH, a secondary increase in plasma concentration being predictive of vasospasm . Recently, Siman and colleagues  studied combinations of neurodegeneration biomarkers for predicting vasospasm, infarction and outcome rather than the use of a single biomarker. They reported an increase for six CSF biomarkers from 3-fold to 10-fold between days 1 and 5 after SAH onset for patients with moderate to severe angiographic vasospasm (14-3-3β protein, 14-3-3ζ protein, ubiquitin C-terminal hydrolase-L-1 (UCH-L1), NSE and two SBDPs cleaved by calpain). These biomarkers were correlated significantly with occurrence of cerebral vasospasm, brain infarction and poor outcome. They reported the 14-3-3β protein, NSE and fragment N-terminal of SBDPs as early predictors of vasospasm . In clinical practice, none of these biomarkers have been clearly validated for the early detection of cerebral vasospasm, the main cause of mortality and neurological deficit after SAH. Larger and prospective studies are required to validate their use for detection of vasospasm, but also to validate therapeutic options guided by biomarker levels aiming at improving neurological outcome. TBI severity can be assessed using the Glasgow Coma Score (GCS) and brain imaging. Minor TBI (GCS 13 to 15) and moderate TBI (GCS 9 to 12) represent 90% of TBI cases, but these types of TBI may induce long-term sequelae. Because of the limits of GCS and imaging, the use of biomarkers to improve diagnosis and classification of TBI could be of interest. Many biomarkers have been studied in TBI to evaluate the association of initial severity with the GCS and neuroradiological findings at patient admission, neurologic outcome predictions with Glasgow Outcome Scale (GOS) at 3 months and 6 months, and mortality prediction. Several biomarkers have been found to correlate with these associated items: S100β protein [56, 57], NSE [58, 59], UCH-L1 [60–62], glial fibrillary acidic protein (GFAP) [57, 58], myelin basic protein [63, 64] and tau protein  in plasma, and S100β protein , UCH-L1, SBDPs [66, 67] and tau protein  in CSF. A recent review summarised CSF and blood biomarkers of mild TBI to predict long-term neurological sequelae and to assess patients with head trauma by classifying them according to axonal, neuronal or astroglial injuries . S100β protein can be released from astroglial cells in many ways: by activation of adenosine and glutamate receptors , by stimulation of astroglial 5HT1A receptors  and by adrenocorticotropic hormone and corticotrophin-like intermediate-lobe peptide . Moreover, S100β protein is secreted from proliferating astrocytes. In TBI patients, the acute increase in plasma S100β protein level is most probably related to massive adenosine and glutamate release in heavily damaged and perfused brain areas . A portion of S100β protein is able to diffuse into the bloodstream. The determination of plasma S100β protein after TBI may be able to differentiate groups of patients with minor or severe injuries. In 226 patients with minor TBI (GCS 13 to 15), the plasma levels of S100β were significantly higher in patients with intracranial injury, with a threshold value of 0.10 μg/l for detecting lesions on CT scan (area under receiver operating characteristic curve = 0.73 (95% CI = 0.62 to 0.84) and sensitivity = 95%) . For 2,128 patients with minor TBI, the plasma threshold was 0.12 μg/l, with a sensitivity of 99% and a specificity around 20% for the detection of intracranial lesions on CT scan. The negative predictive value was 99.7% (95% CI = 98.1 to 100%) . A S100β protein level below 0.12 μg/l at patient admission could therefore be used to exclude post-traumatic intracranial lesions on CT scan. However, these data require confirmation in a larger study. S100β protein, initially considered to be located only in the central nervous system, is expressed in other tissues such as adipocytes or chondrocytes. High plasma protein S100β has been observed after multiple traumas in patients without brain damage, leading to questioning of its usefulness for predicting neurological outcome in those patients . Goyal and colleagues  studied S100β protein temporal profiles in the CSF and plasma of adults with severe TBI. Their temporal serum profiles were associated with acute mortality, perhaps because of extracerebral sources in the serum as represented by high Injury Severity Scores, but the CSF S100β protein profiles were associated with outcomes and mortality . In clinical practice, the S100β protein level can be obtained in 1 hour and its cost is approximately €15. NSE is one of the five isoenzymes of glycolytic enolase in central and peripheral neurons. NSE is localised in neuron cytoplasm and is most probably involved in the increase of chloride concentration at the beginning of neural activity . This marker has been used to evaluate neuronal functional alterations. NSE is passively released rapidly in the plasma after TBI by cell destruction. The NSE plasma concentration at patient admission for TBI has been found to be twofold higher than normal reference values . Despite these promising data, several studies have produced disappointing results. Because of the slow elimination (biological half-life of 48 hours) of NSE from the plasma, quantification of the amount of brain injury and distinction between primary and secondary insult remains difficult using plasma NSE . Furthermore, NSE can be released into the plasma from red blood cell haemolysis, resulting in possible confounding factors . UCH-L1 is highly and specifically expressed in neurons. UCH-L1 represents approximately 1 to 5% of the total soluble proteins within the brain . This protein is involved in the addition and deletion of ubiquitin-dependent protein (via the ATP-dependent proteasome pathway), playing an important role in the removal of excessive, oxidised or abnormal proteins during normal and neuropathological conditions . One study reports higher concentrations of UCH-L1 in the CSF of patients with severe TBI (44.2 ng/ml) compared with a control group (2.7 ng/ml) . UCH-L1 is released within 6 hours after trauma and peaks in the first 24 hours in the CSF. This study reported an area under the curve (AUC) of 0.88 (95% CI = 0.68 to 1.00) using UCH-L1 CSF levels within the first 6 hours versus control patients. UCH-L1 appears to be able to distinguish TBI and uninjured control patients at 6 hours when the mental status can be confounded by drugs, alcohol or other pathology. Recently, Papa and colleagues  compared early UCH-L1 plasma levels (within 4 hours of injury) of patients with mild and moderate TBI with uninjured and injured control patients in a prospective cohort study. They reported a significant difference between UCH-L1 levels in CT-negative patients versus CT-positive patients (0.62 ng/ml vs. 1.61 ng/ml, respectively) with an AUC of 0.73 (95% CI = 0.62 to 0.84). Moreover, UCH-L1 levels allow one to distinguish mild and moderate TBI from uninjured control patients with an AUC of 0.87 (95% CI = 0.82 to 0.92) and to distinguish TBI with GCS 15 from controls with an AUC of 0.87 (95% CI = 0.81 to 0.93) . GFAP is a protein involved in astrocyte cytoskeletons by forming networks with filaments that provide support and strength to cells. Glial cells specifically express GFAP, which is involved in several neurological processes such as BBB integrity. An increase in the plasma concentrations of GFAP in patients with severe TBI (0.10 ± 0.18 μg/l on admission, 0.012 ± 0.026 μg/l 24 hours after injury and 0.017 ± 0.052 μg/l 48 hours after injury) has been reported compared with healthy volunteers (0.004 μg/l) . Moreover, critically injured trauma patients without TBI had significantly lower levels of plasmatic GFAP compared with patients with TBI documented on head CT scan . In addition, the plasma concentration of GFAP is not affected by multiple traumas without brain injury . GFAP has recently been reported as highly vulnerable to proteolytic modifications in vitro and in vivo. Breakdown products of GFAP are therefore likely to be present in biofluids. GFAP breakdown product levels are able to differentiate TBI patients from uninjured controls with an AUC of 0.90 (95% CI = 0.86 to 0.94) and differentiate TBI patients with a GCS of 15 from normal controls with an AUC of 0.88 (95% CI = 0.82 to 0.93) . More recently, the prospective Transforming Research and Clinical Knowledge in TBI study evaluated the diagnosis accuracy of elevated levels of GFAP breakdown products in TBI patients. This study confirms the good correlation between GFAP breakdown product levels and CT scan findings in TBI patients . Pineda and colleagues reported an increase in SBDP concentration in the CSF after severe TBI . More recently, Mondello and colleagues  studied 40 severe TBI patients using SBDP measurement in the CSF from ventriculostomy catheters every 6 hours for a maximum of 7 days following TBI, comparing them with control patients. Compared with control patients, both SBDP145 (14.42 ± 0.91 ng/ml vs. 0.52 ± 0.22 ng/ml) and SBDP120 (6.05 ± 0.28 ng/ml vs. 1.21 ± 0.48 ng/ml) CSF concentrations were increased in severe TBI. The degradation of products appears to be different, with an earlier peak for SBDP145 (29.56 ng/ml at 6 hours) compared with a late peak for SBDP120 (11.96 ng/ml at 138 hours). These observations suggest that cell death via necrosis or apoptosis is activated with a different time course after severe TBI. In addition, patients who died after TBI exhibited higher concentrations of SBDP145 and SBDP120 than survivors within 7 days post-trauma . In clinical practice, only S100β protein may be used to screen patients with minor TBI (GCS 13 to 15) and exclude CT-scan lesions when the plasma level is below 0.12 μg/l at admission. UCH-L1 may have the same utility but prospective studies with larger samples are required. GFAP has the advantage of not being influenced by peripheral injuries, contrary to S100β protein and NSE, and is therefore probably more specific for brain injury . The use of biomarkers for classification of TBI is certainly of major interest, but large clinical studies validating strategies based on biomarkers use in TBI are still lacking, particularly in severe TBI patients. The use of biomarkers to diagnose stroke very early and the precise extent of brain damage may be useful in the application of specific therapeutic strategies. The difficulty with this approach relates to the heterogeneity of the brain cell population, different tolerances to ischaemia and distribution in the central nervous system, complexity of the ischaemic cascade and integrity of the BBB. Biomarkers may also reflect the different steps of cerebral ischaemia, such as inflammation, glial activation and neuronal injury. Several studies have described a significant increase in plasma levels of S100β protein within the first 3 days after cerebral infarction [89, 90]. In stroke, high levels of adenosine occur in the core of the infarct, not perfused with blood. S100β protein accumulated in this region cannot be released into the bloodstream and thus does not contribute to any observed increase in plasma levels. The pattern of reactive astrogliosis observed in animals and human studies explains the plasma S100β protein temporal profiles in stroke patients, with plasma S100β protein peaking later than in TBI patients. A recent review described the serum S100β temporal profile after stroke onset. There is a gradual concentration increase starting 8 to 10 hours after onset of symptoms, followed by a peak at 72 hours and then a drop at 96 hours . Lower plasma concentrations of S100β have been reported in only one study, in patients with transient ischaemic attack (TIA) or normal brain CT on admission in comparison with individuals with neurological deficits or abnormal brain imaging displaying cortical infarcts . A correlation has been observed between plasma levels of S100β protein and the size of cerebral infarction [92, 93]. An association has been described between S100β protein plasma levels and the National Institutes of Health Stroke Score [89, 94]. However, the delayed kinetics and low specificity preclude this association for diagnostic use in acute stroke situations. The increase in plasma S100β is not specific for cerebral infarction and can be observed with other neurological conditions such as TBI and extracranial malignancies, possibly leading to biased interpretations of results. The clinical performance of S100β protein therefore does not appear to be robust enough to differentiate ischaemic stroke, haemorrhagic stroke and stroke mimics. Despite these factors, S100β concentrations could be an additional tool for the identification of patients at high risk of specific early neurological complications in clinical practice. Indeed, a plasmatic S100β level >1.03 μg/l at 24 hours after the onset of stroke predicts malignant infarction in patients with proximal middle cerebral artery occlusion, with a sensitivity of 94% and a specificity of 83% . Another study has reported higher S100β prethrombolysis concentrations in patients who developed haemorrhagic transformation after thrombolysis treatment compared with patients who did not (0.14 vs. 0.11 μg/l) . A recent study examined 458 patients with ischaemic stroke who were not treated with thrombolytic drugs. At admission, patients with clinical deterioration caused by haemorrhagic transformation had higher concentrations of S100β and tight-junction proteins, which are markers of BBB breakdown. An analysis of these proteins levels could be used to screen for and predict the risk of haemorrhagic transformation . Methylarginines are synthesised by post-translational methylation of l-arginine and are released as free dimethylarginines after proteolysis. Asymmetric dimethylarginine (ADMA) and symmetric dimethylarginine are detectable in blood, urine and CSF. Whereas symmetric dimethylarginine is inactive, ADMA is a potential inhibitor of nitric oxide synthase, which is involved in endothelial dysfunction . An increase in the ADMA plasma concentration is thus assumed to be a surrogate marker for the risk of ischaemic stroke. Yoo and Lee reported a significant difference between ADMA plasma concentrations in healthy control patients (0.93 ± 0.32 μmol/l), ischaemic stroke patients (1.46 ± 0.77 μmol/l) and patients with initial recurrence of ischaemic stroke (2.28 ± 1.63 μmol/l) . Another study that included 880 women revealed that an increase of 0.15 μmol/l ADMA in plasma leads to a 30% increased risk of ischaemic stroke and myocardial infarction . In addition, the Framingham Offspring Study evaluated plasma ADMA concentrations from 2,013 individuals for whom simultaneous neuroimaging studies were available. The ADMA concentration was independently associated with an increased prevalence of magnetic resonance imaging abnormalities in the absence of clinical symptoms, which is a well-known risk factor for pre-emptive stroke . Matrix metalloproteinases are a family of zinc-dependent and calcium-dependent endopeptidases responsible for turnover and degradation of extracellular matrix proteins. The expression of MMP-9 in brain tissue under normal conditions is very low, but increases in MMP-9 expression have been demonstrated in ischaemic brain tissue . The upregulation of MMP-9 occurs in brain tissue in response to injury and is believed to play a central role in the pathophysiology of ischaemic stroke by degradation of extracellular matrix proteins. After the onset of cerebral ischaemia, the uncontrolled expression and activity of MMP-9 mediate proteolysis and lead to BBB leakage and cell death. Increases of MMP-9 plasma concentrations have been demonstrated in both ischaemic (149.6 ± 99 ng/ml) and haemorrhagic stroke patients upon presentation to the emergency department compared with healthy individuals (<97 ng/ml), suggesting a relatively short time period (within hours) from release to detection in the plasma [103, 104]. Plasma concentrations of MMP-9 are also related to cerebral infarction size, neurological outcomes and haemorrhagic transformation, especially after fibrinolysis [104–106]. At patient admission to the hospital, plasma concentrations of MMP-9 are predictive of cerebral infarct volume on magnetic resonance imaging and are correlated with stroke lesion growth, even after thrombolysis administration . 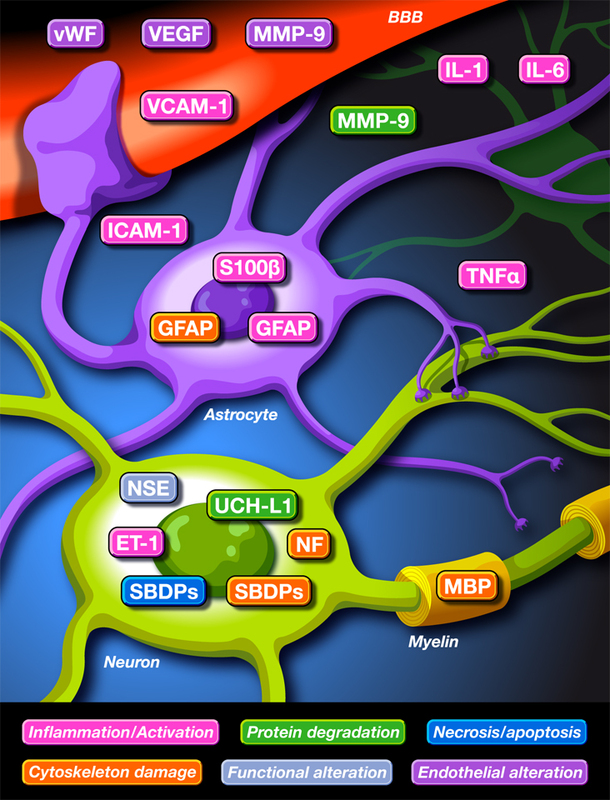 Receptors for N-methyl-d-aspartic acid bind the glutamate neurotransmitter and are expressed mainly by neuronal cells. The receptors contain four subunits (two NR1 and two NR2 subunits), and fragmentation of NR2 into NR2A and NR2B peptides is thought to occur during cerebral ischaemia or neurotoxicity [108, 109]. The generation of N-methyl-d-aspartic acid receptor antibodies (NR2Abs) is mediated by the immune response following ischaemic events. The NR2Abs and NR2 peptides can be assayed in blood and CSF. Several studies have examined the potential usefulness of NR2Abs and NR2 peptides as markers of ischaemic stroke. Dambinova and colleagues reported an increase in NR2Ab plasma concentrations during ischaemic stroke (5.01 ± 1.23 μg/l) and TIA (4.02 ± 2.04 μg/l) in 105 patients compared with 255 control subjects (1.49 ± 0.22 μg/l) . NR2Abs are not able to discriminate stroke from TIA. Moreover, the NR2Ab increase is not observed after haemorrhagic stroke, suggesting that a negative NR2Ab result could be used to rule out haemorrhagic stroke. A threshold ≥2 μg/l has a sensitivity of 97% and a specificity of 98% in the diagnosis of ischaemic stroke or TIA within 3 hours after symptom onset. An increase of antibodies can be observed in hypertensive patients and in patients with a history of ischaemic stroke or atherosclerosis . Thus, it is unclear whether the increase in antibody level reflects an acute episode of cerebral ischaemia or is a potential predictor of cerebrovascular events. A prospective multicentre study of 557 patients undergoing coronary surgery reported that 24 of 25 patients with a preoperative concentration NR2Ab ≥2 μg/l revealed neurologic complication within 48 hours after surgery . Clinical studies have demonstrated an increase in GFAP plasma levels after ischaemic stroke compared with control subjects, with a peak between day 2 and day 4 after onset of symptoms . A prospective study involving 135 patients admitted 6 hours after onset of stroke symptoms reported detection of serum GFAP in 81% of patients with haemorrhagic stroke but in only 5% of those with ischaemic stroke . Furthermore, plasma levels of GFAP were significantly higher in haemorrhagic stroke patients (mean value 111.6 ng/l) than in ischaemic stroke patients (mean value 0.4 ng/l). With a threshold value of 2.9 ng/l, the sensitivity was 79% and the specificity was 98% for differentiating ischaemic stroke from haemorrhagic stroke. In a study by the same team, the optimal timing to differentiate cerebral ischaemia from haemorrhage with GFAP was 2 to 6 hours after symptom onset . A multicentre study focusing on S100β protein, NSE, GFAP and activated protein C–protein C inhibitor complex demonstrated the ability of GFAP to differentiate haemorrhagic stroke from ischaemic stroke, which has not been observed for other proteins . Moreover, the combination of GFAP with activated protein C–protein C inhibitor complex and the National Institutes of Health Stroke Score led to a diagnostic sensitivity and negative predictive value of 100%, allowing exclusion of haemorrhagic stroke, which is potentially useful for early initiating fibrinolysis. Stroke has been characterised by biomarkers of infarct size and damage to the BBB. Recent studies have reported stable precursor fragments of the neuropeptides encephalin (proenkephalin A (PENK-A)) and substance P (protachykinin A) as potent markers of BBB integrity . Both neuropeptides are active as neurotransmitters and are involved in nociception and immune stimulation. Doehner and colleagues  recently evaluated PENK-A and protachykinin A in 189 patients presenting with symptoms of acute cerebrovascular disease. Plasma concentrations of PENK-A were significantly increased in acute stroke patients (123.8 pmol/l) compared with patients with TIA (114.5 pmol/l) or nonischaemic events (102.8 pmol/l). The elevation of PENK-A was correlated with stroke severity (National Institutes of Health Stroke Score) and with CT infarct size. Moreover, increased PENK-A concentrations predicted 3-month outcomes for mortality, stroke recurrence and myocardial infarction. Protachykinin A concentrations did not demonstrate any discriminative power . Several other biomarkers, mostly nonspecific, were studied either alone or in combination in the context of stroke. Combinations of several biomarkers have been developed to increase the sensitivity and specificity of the diagnosis [118–121]. In clinical practice, the main interest for stroke biomarkers is probably in the ability to discriminate ischaemic strokes from haemorrhagic strokes or TIA, allowing an early initiation of fibrinolysis. When taking into consideration the specificity for ischaemic event detection and the kinetics for biomarker increase, plasma PENK-A seems to be one of the most interesting biomarkers for acute ischaemic stroke detection. Figure 1 summarises the main biomarkers examined in SAH, TBI and stroke. They are classified according to their significance in brain injury dynamics. Main biomarkers used in subarachnoid haemorrhage, traumatic brain injury and stroke. Biomarkers can be classified according to their role in brain injuries: inflammation and activation; protein degradation; necrosis and apoptosis; cytoskeleton damage; functional alteration; and endothelial alteration. BBB, blood–brain barrier; ET-1, endothelin-1; GFAP, glial fibrillary acidic protein; ICAM-1, intercellular adhesion molecule-1; IL, interleukin; MBP, myelin basic protein; MMP-9, matrix metalloproteinase-9; NF, neurofilament; NSE, neuron-specific enolase; S100β, S100β protein; SBDP, α2-spectrin breakdown product; TNF, tumour necrosis factor; UCH-L1, ubiquitin C-terminal hydrolase-L-1; VCAM-1, vascular cell adhesion molecule-1; VEGF, vascular endothelial growth factor; vWF, von Willebrand factor. The use of biomarkers in the treatment of brain injuries and brain diseases is of considerable interest for improving diagnosis and prognostication. These surrogate markers must nevertheless be used with caution. Stricto sensu, their performance at predicting an event can be applied only to populations in which they have been validated. The overuse of biomarkers for brain injuries could induce both expensive and counterproductive strategies. However, it appears reasonable to limit their use for clinical research. Research on biomarkers of brain injury should remain a strong priority, as biomarkers could be a key factor in personalised medicine. New developments such as omics tools should be used in stroke treatment and therapy, similar to how they have been used recently in cardiovascular disease . In parallel with the discovery of new biomarkers of brain injury, the economic performance of these biomarkers needs to be evaluated in both large cohorts of patients and in selected and targeted populations with complicated clinical situations and high uncertainty.